Point of Success Special Edition offers secure, built-in credit card processing. 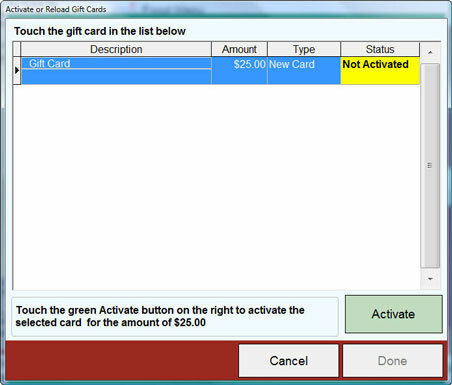 Credit and gift card processing are available only in the United States. Beginning July 1, 2010, companies who accept credit card payments must be compliant with all applicable PCI-DSS (Payment Card Industry Data Security Standard) requirements. This includes using validated payment processing software, securing computers and the network where the software is used, and taking other measures to ensure a secure credit card data environment. Credit card sales are easier when your POS system has built-in credit card support. When you process credit cards in Point of Success, every computer on your network can be a credit card terminal. Point of Success uses ChargepathTM payment processing software. ChargepathTM meets all PCI-DSS credit card security requirements and stores no credit card data on your computer system. Vantiv Integrated Payments specializes in credit card processing integrated in point of sale systems. Gift card processing is very secure. Cards can only be activated or reloaded after payment has been received for the card. Cards have no value until they are activated through Point of Success Special Edition. Complete business reporting trough Point of Success Special Edition and Vantiv Integrated Payments tells you the gift cards you sold, the amount of redemptions used to pay for customer orders, and the amounts outstanding on your cards.